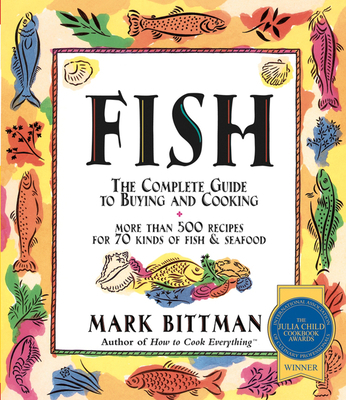 Fish: The Complete Guide to Buying and Cooking is a book that simplifies, once and for all, the process of preparing fish. Organized in an easy-reference, A-Z format, Fish gives you the culinary lowdown on seventy kinds of fish and shellfish commonly found in American supermarkets and fish stores. Each entry describes how the fish is sold (fillets, steaks, whole, salted), other names it goes by, how the fish should look, and buying tips. Fish begins with general guidelines on how to store, prepare, and cook fish, whether sauteing, frying, grilling, or smoking, and you will find easy-to-follow illustrations of such important basics as how to gut and fillet a fish. Fish also includes up-to-the-minute information on the health benefits of fish in our diet. In addition, there are more than five hundred recipes and variations, all of which use low-fat, high-flavor ingredients to accent the intrinsic natures of the individual fish rather than mask them. And the vast majority of the recipes are ready in less than thirty minutes. MARK BITTMAN is the author of 30 acclaimed books, including the How to Cook Everything series, the award-winning Food Matters, and the New YorkTimes number-one bestseller, VB6: Eat Vegan Before 6:00. For more than two decades his popular and compelling stories appeared in the Times, where he was ultimately the lead food writer for the Sunday magazine and became the country’s first food-focused Op-Ed columnist for a major news publication. Bittman has starred in four television series, including Showtime’s Emmy-winning Years of Living Dangerously. He has written for nearly every major newspaper in the United States and many magazines, and has spoken at dozens of universities and conferences; his 2007 TED talk has had more than a million views. In 2015 he was a distinguished fellow at the University of California, Berkeley; he is currently a fellow at the Union of Concerned Scientists. Throughout his career Bittman has strived for the same goal: to make food, in all its aspects, understandable. He can be found at markbittman.com, @bittman on Twitter, and @markbittman on Instagram.